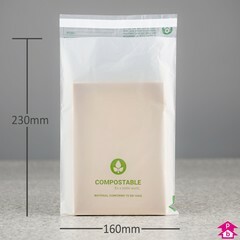 Semi-transparent mailing bags made from a compostable material that is milky-white in colour, silky to the touch, and made from natural biological sources (such as potato-starch) that is suitable for industrial or home-composting. 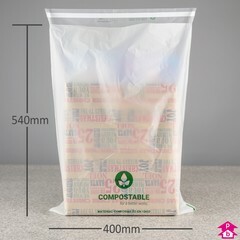 The compostable material is also thermoplastic and plasticiser-free. 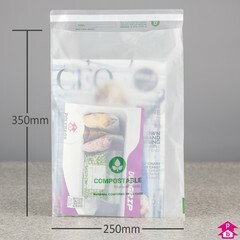 The back (sealing side) of the bags are printed with a green compostable leaf logo and the words 'COMPOSTABLE for a better world', with 'MATERIAL CONFORMS TO EN 13432' underneath. 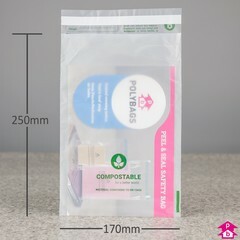 With self-adhesive peel 'n seal strip (see notes). Sender address box and safety warning notice printed on the flap. 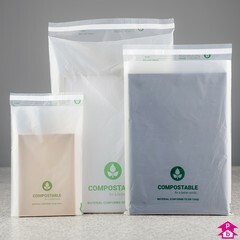 Biobased carbon-share of entire formulation exceeds 30% (in accordance with ASTM D6866). 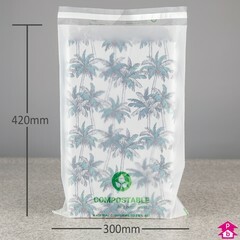 Due to the nature of the material the peel 'n seal strip is only semi-permanent on initial contact sealing. 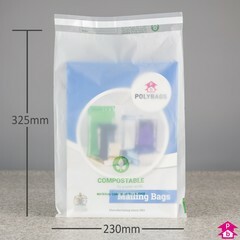 A permanent seal requires the mailer to be left at room temperature for several hours once sealed.